As far as the hunt went, we were skeptical to start the day based on the weather and water conditions. Ice and skim ice on 90% of the pond and no wind. The temperature was 25 degrees at shooting time, so rather than try to keep a hole clear and use what little wind there was, we decided to use the largest open spot we could find on the pond thinking that with no wind we were better off trying to keep our decoys ice free and as natural as possible. While we didn't see a large number of ducks what we did see seemed to work the pond and give us a look. Not many decoyed feet down but we got enough to swing close enough that we were able to shoot our 18 bird limit. The dog in the picture is Jake. He got his workout. 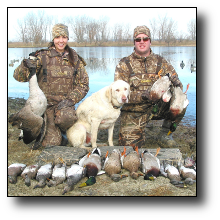 Because of the lack of wind, the birds wouldn't finish and most of our shots were 35 yards plus, which made many of his retrieves 40 to 50 yards, with 4 or 5 more than 100 yards, breaking ice the entire way. We only had one goose fly nearby and we were able to talk it in. It decoyed perfectly! As far as guns and loads, we were shooting 2 Benelli Super Black Eagles and 1 Browning Gold with 3.5" loads of Heavy Metal # 2's. All in all it was a very successful and great hunt! The hunters pictured are my son Jeremy and his friend Rachel.